I think the use of mixed berries sounds perfect!! And I love that you made your own brown sugar. Your cake turned out deliciously. Yum! Your cake looks sooo good, the crumbtopping is perfect! I want to try it with mixed berries next time to get a bit of everything. Ooh, love the berries and the red color! Your cake looks great! 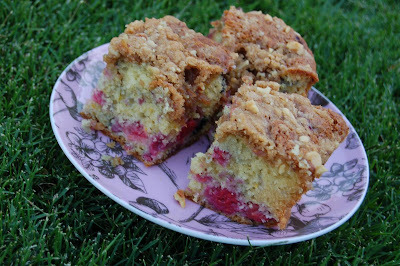 I love the way that the berries look in the cake, so nice and pinkish red and cheerful! The cake looks delicious and I think it's great that you subbed the mixed berries. It looks delicious and very pretty! I'm with you on the chopping the nuts and using less dishes, there were a few, weren't there? Hey I won! How exciting, it's 6:30 this morning and that just made my day! I have never won anything on a blog yet! Whahoooo! Mixed berries in this is such a fabulous idea. The mixed berries do sound yummy. My topping was a bit moist, too. Still good, but not as clumpy as I thought it might be. Great job. wow.. that looks pretty spectacular with mixer berries. A little pink and purple... still beautiful and delicious of course. And I love your ingenuity with the lack of brown sugar.. brillian! Yum! I do love how this is such a versatile recipe, both in what you put in it and when you eat it! What a perfect treat to cap off a fun day of train riding! I just joined this fun group!! This recipe was great! I made muffins and they were delish! I love your mixed berry variation. So colorful. Nice job! Your cake is beautiful! The berry mixture looks so good! I love the color. I thought about doing mixed berries, but I think I definitely will use them next time. Anne, you have one of the best looking cakes out there! I love how it looks on your beautiful plate on the grass. Berries are still crazy expensive here, too, so I used frozen. 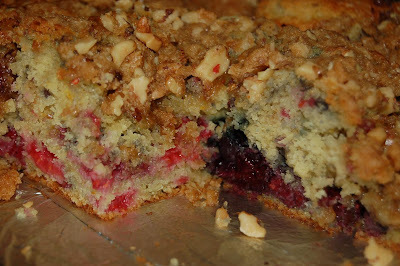 Your cake looks wonderful with the mixed berries! I skipped blueberries too since they're still expensive around here. I made mine with cranberries but am definitely looking forward to the blueberry version! Nice!! I loved this recipe it was sooo tasty! thanks for the tip on the brown sugar--I am going to try that the next time I run out! your cake looks yummy , well done !! I think I am missing out on this whole twd. Everything always looks so delicious!! Wow, you have a train park? How cool is that. I love going to the park with the kids. I can not believe your BB are $5! Crazy. I would have passed on them, too. Your cake looks so amazing. Very tall and moist looking. I love the colors. Don't you just love Alton. He is crazy cool. Your cake looks wonderful. Wow I am so glad you posted making your own brown sugar. I seem to forget that on the list every now and then and am glad for the alternative. Yum!! the mixed berries look great in this. Sounds like you had a lovely day! Looks fantastic! The berries give it such a great color too! I love how colorful the mixed berries are - this is one cake that isn't hurt by using frozen berries, for which I am very grateful. Gorgeous! Mixed berries is a great idea! Mine definitely could have used a little berry moisture. Your cake looks great! What a great idea - Mango? That is awesome, I absolutely love mango. Thanks I hope you do try and post about it!